“Welcome to the first event at our new training centre!”… a tongue-in-cheek opening line from Rupert to introduce the first Flamsteed member’s event to be held at Mycenae House in Blackheath. In truth, we have been looking around for an additional venue to hold workshops for Flamsteed members, as, though the Royal Observatory is an excellent venue, we are restricted on the dates and times when we can run workshops. This inaugural workshop at Mycenae House was on “Solar System Imaging”, ably presented by Rupert Smith. 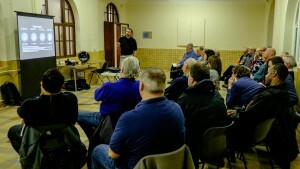 We had around 25 Flamsteed members in attendance, all keen to learn more about how to image the planets. Rupert explained that solar system imaging is about trying to capture high-resolution images of the planets, the Moon and the Sun. “It is quite simple to get good quality images without spending a lot of time capturing hours of images”, stated Rupert, who then went on to describe the basic equipment needed to capture images of the planets… mounts, telescopes and cameras. For the best results, Rupert explained, a solid equatorial mount with accurate polar alignment is required. With any planetary imaging, you are working at very long focal lengths, so any inaccuracies in polar alignment are highlighted very quickly. Rupert introduced a technique to get accurate polar alignment, using a software tool. Any telescope can be used for planetary imaging, but long focal lengths and large objectives are ideal. Reflectors tend to be the most cost effective option for planetary imaging. As regards cameras, again, any video camera can be used, including the video mode on DSLRs, but the best option is a dedicated high frame rate camera. Rupert went on to describe how to optimise the telescope and camera combination, by introducing how to calculate the ideal pixel size for a planetary camera based on the objective size and focal length of your telescope. A very useful piece of knowledge. Rupert also explained how to calculate exposure times, taking into account the speed of rotation of the planet. This is particularly useful for planets like Jupiter, which has a rotation period of less than 10 hours. After a discussion on focussing techniques, and a short intermission for attendees to visit a very well stocked bar at Mycenae House (all very civilised! ), Rupert moved on to processing techniques, using various software tools to clean, align, stack and sharpen images. The workshop finished off with a short discussion on how to image the Sun… very prescient with the solar eclipse coming up on 20th March. There will be a “part 2” to this workshop at some point in the future, where more advanced techniques will be discussed. If “part 1” was anything to go by, we are in for a real treat. 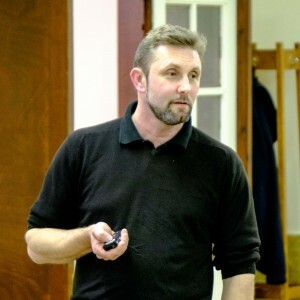 Many thanks to Rupert for all of his work in putting together a very useful and enjoyable workshop.